I did watch Melancholia last weekend, maybe it's still messing with my mind? 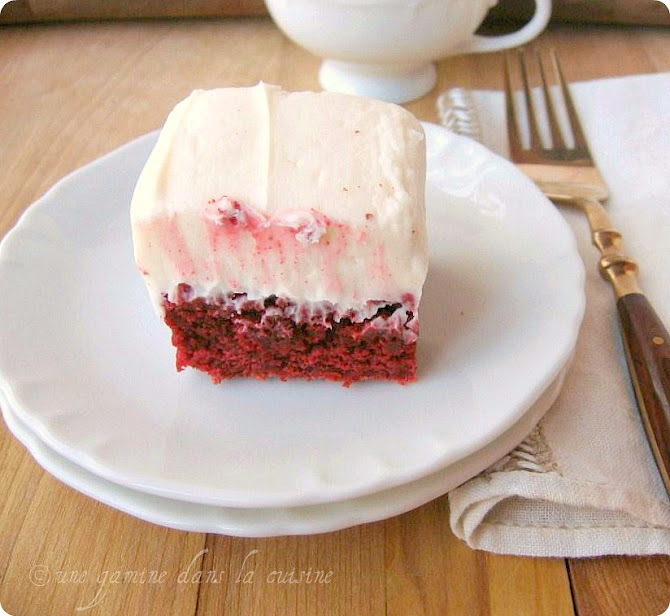 Speaking of fairy-tales and the surreal, how about these red velvet brownies? Initially I had visions of a fluffy, cakey, brownie/cake hybrid. But these are, in fact, brownies. And I think that as long as you bear that in mind, you will love this recipe! Because I used an 8x8-inch pan instead of the required 9x9-inch, my brownies ended up with a puffed, dry, cracked top which I had to peel off and, unfortunately, discard. However, underneath that dry 'roof' lay a dense, fudgy, perfect brownie. 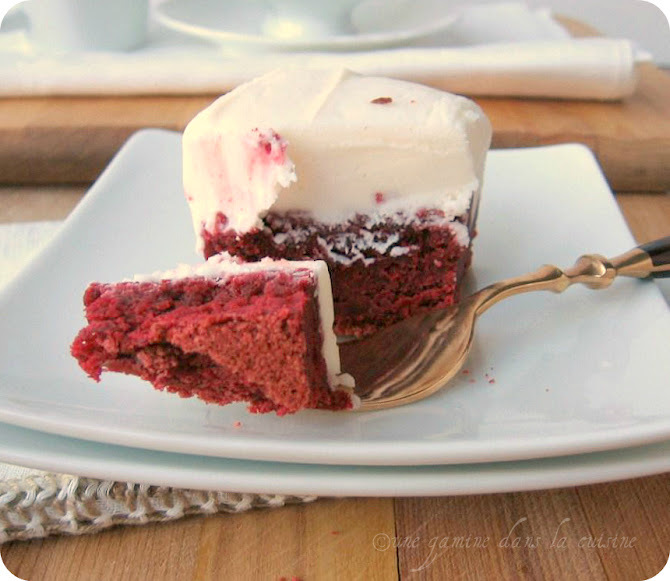 And lets not forget about the cream cheese frosting. As you can see, the ratio of frosting to brownie was slightly unbalanced...I didn't hear any complaints. So my advice on this recipe is to use the right pan size (9x9-inches). If you want the same high-hat frosting, increase the amount of cream cheese by 4 oz. and up the confectioners' sugar to about 3 cups. And be sure to have people around to share these with! They're extremely addicting, and rich. In a large, heat-proof bowl, combine the chopped chocolate and butter. Place the bowl over a pan of simmering water (make sure the bottom of the bowl doesn't touch the water). Stirring occasionally, melt the chocolate and butter together until smooth. As soon as the mixture is smooth, remove the bowl from the heat. Whisk in the sugar until well blended. Add the eggs, one at a time, whisking till each one is just blended. Add the flour, food coloring, baking Powder, vanilla, and salt. Using a large spatula, gently fold everything into the chocolate mixture just until all the streaks of flour have disappeared. Pour the batter into prepared pan. Bake for 40-45 minutes, or until toothpick inserted in the center holds only a few moist crumbs. Remove from the oven and place the pan on a cooling rack. Cool completely before frosting. Frosting: In a large mixing bowl, combine the softened cream cheese and butter. Beat on medium speed until creamy (about 2 minutes). Add the confectioners' sugar in 1/2-cup increments, beating well after each addition. If the frosting looks thin, and un-spreadable after adding 1 1/2 cups, add an additional 1/2 cup of sugar. Add the salt and vanilla. Beat on high speed until fluffy (about 1 minute). Lovely brownies! That frosting is awesome. I am all over that brownie to frosting ratio!! I like feeling wistful and nostalgic too. I call it the Casablanca effect. So often the best books and movies have a slightly bittersweet twist. It is hard not to feel wistful and nostalgic, especially around the holidays. I am big on nostalgia and often find myself longing for our family Christmases from years gone by. Those brownies are simply gorgeous! 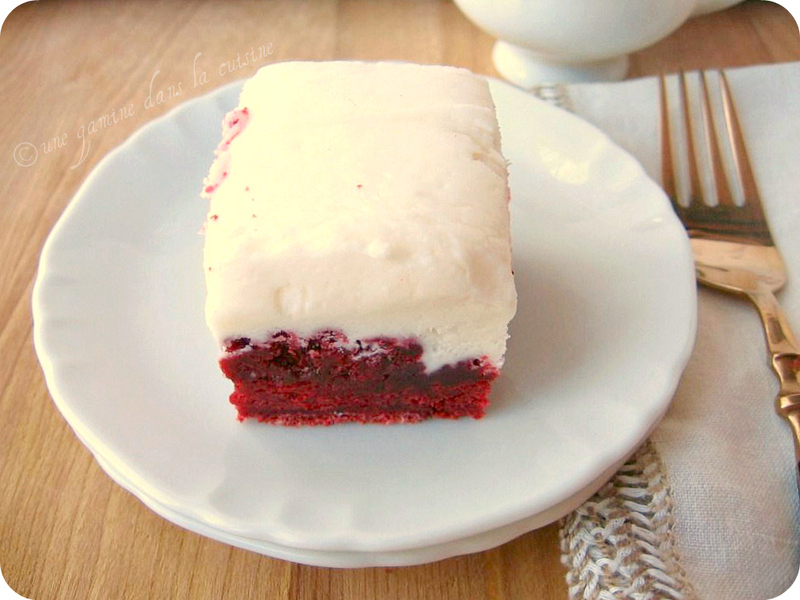 The rich red color of the brownie with the dense white frosting - amazing! I will bet they tasted fantastic. Lovely! I found this blog on Foodgawker. I love baking so I'm always looking through random blogs. This is one of the best blogs I have come across. I love it. We must have similar taste in baked goods because I would make almost everything on here. Keep doing what you're doing. I'm making this one of my few must reads. Yummy! These red relvet brownies must be delicious! I can't wait to take a big bite! By the way, thanks for visiting my blog.